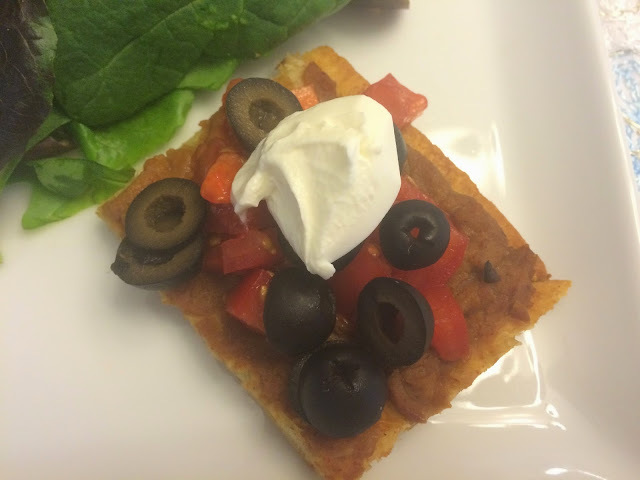 Taco Pizza is an easy-to-prepare weeknight dinner option and is super kid friendly! Your kids might even enjoy helping with the preparation of this fun meal. While we at Cali's Cuisine generally do not approve the use of poppin' fresh dough as a general rule (sorry, Pillsbury Doughboy! ), sometimes it is necessary to cheat a bit in the name of getting something on the table in order to maintain as much sanity as you still have at the end of a hectic day. Refrigerated croissant dough combined with refried beans are the main ingredients of Taco Pizza. You can customize toppings to suit your taste. Line cookie or baking sheet with parchment paper. Unroll the two croissant doughs side by side. Pinch seams together along preferations as well as between the two doughs. Bake 8 - 12 minutes or until beginning to turn golden brown. Meanwhile, mix refried beans with water and taco seasoning. When crust is slightly browned, remove from oven and evenly spread refried beans over the crust. Add cheese if desired. Return the pizza to the oven and bake until thoroughly warmed, approximately 8 minutes. Cut into squares (12 works well) and serve with toppings as desired. NOTE: Ground meat could easily be combined with refried beans if desired. Hey Cali - this is a super idea\ to make Taco - pizza's for a quick dinner! Genius! Cali this look awesome! LOve it! I love taco pizza... yours sounds tasty. What a lovely idea for a family-style dinner! I could eat pizza everyday Cali - taco pizza sounds brilliant!